Listen to Dr. Gary North deliver a graduation speech to the 8th grade graduates of the Ron Paul Curriculum. Learn how this self-taught, video-based curriculum can give your students a head start in college and in life. You can watch and to listen to this speech at the Ron Paul Curriculum website. Click here. This page lists each course from 6th grade to 8th grade and includes a course description along with a link to the podcast episode and the Ron Paul Curriculum course overview page. You can watch the first 5 lessons for each course on the course overview page. Dr. Gary North is the author of over 60 books, including Honest Money, Salvation Through Inflation, and a 31-volume Economic Commentary of the Bible. 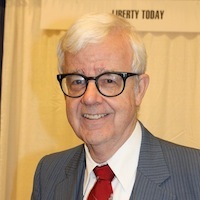 He has published the Remnant Review newsletter since 1974. He has written over 1,250 articles on Lew Rockwell.com. Dr. North received his Ph.D. in American history from the University of California, Riverside. Dr. North teaches economics, U.S. history, business, government, and the high school English courses for the Ron Paul Curriculum.